Woodshedder is starting a new series called “Indicators and edges” in which he will be testing the effectiveness of different indicators. I’m looking forward to reading it. Last night he posted some baseline results of the general market. In doing so he noted that the percentage of up days on his list of stocks fell much below the % of up days for the major indices. In noticing this he asked if anyone had a possible explanation. I think a long-term look at the Nasdaq Advance/Decline line could explain a lot of it. I pulled the below data from Worden Bros. TC2000. 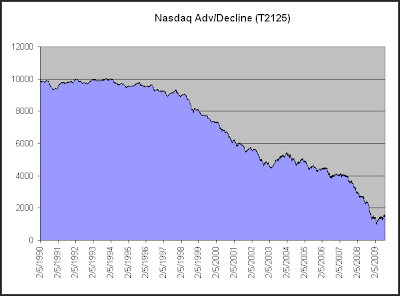 Here we see that the Nasdaq Adv/Decl has consistently dropped over the years. While this chart only goes back to 1990, the strong negative bias exists all the way back to the inception of the Nasdaq in 1971. Even during the Nasdaq bubble days of the late 90’s the Nasdaq Advance/Decline couldn’t muster a rising slope. 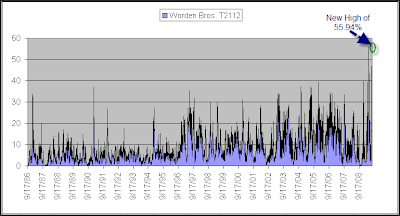 Worden Bros. was obviously aware of this tendency when they set their beginning value at 10,000 rather than 0. Over the 1990 – present time period shown above the NYSE Advance/Decline line has seen a slight decline, but it doesn’t have the consistent negative bias of the Nasdaq. This is mostly due to the fact that the Nasdaq has lower listing standards than the NYSE, so if a company is going to go broke it is more likely to do so on the Nasdaq. An issue which IPOs at $25 and heads to $0 will contribute a lot of declining votes each day along the way, and that is more likely to take place in the Nasdaq. This was first explained to me by Tom McClellan. If you’re interested in breadth statistics, I’d highly recommend checking out some of the work of the McClellans. You may also want to check back on Woodshedder’s studies over the next few weeks as well. I’m sure there will be some interesting results. Pretty solid results across the board suggest an upside breakout appears more likely than a pullback at this point. With the S&P going nowhere for the last 3 days, traders may want to review this study from July. I don't have time for a new study right now, but will hopefully get something out later today related to trading this type of environment. This demonstrates just how extreme the current move is in terms of breadth. Also interesting about the chart is that we aren’t that far removed time-wise from extremely low readings. Extreme overbought doesn’t necessarily mean a decline is about to begin. In fact the last time these levels were reached in 2004, the market continued to trudge higher for about 2 ½ months before finally beginning a meaningful correction. I’ve discussed the equity put/call ratio a few times recently. In the June 12th blog I showed how extremely low readings have often been followed by selloffs. I also did a follow up to that study in the August 14th blog. The criteria I used was a put/call ratio of more than 25% below its 200-day moving average. 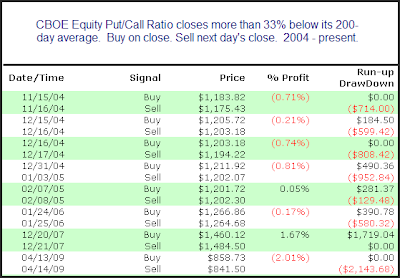 The CBOE has only reported the equity put/call ratios since 10/2003. On Friday the CBOE reported the lowest relative equity put/call ever. It came in at 0.39, which is nearly 45% below its 200-day moving average. This is only the 2nd time it has closed as much as 40% below the 200. The other time was 11/15/04. The SPX dropped 0.7% the next day but that was basically the end of the selloff. A few more days of chop was followed by a further market rally. Below I’ve listed all instances where the equity put/call came in 33% or more below its 200ma. It will be interesting to see if the inclination to sell off following extremely low equity put/call ratios can overcome the market’s recent positive momentum. One sign of a potential top that some traders monitor is distribution days. It was popularized by Investors Business Daily. The essential idea is that when the market falls on increasing volume that suggests institutions are selling stock. When clusters of distribution days occur, it is a topping signal. Below are some quotes from an IBD column published on August 4th that discusses distribution. “What you're looking for is distribution. If one or more of the major indexes (the NYSE composite, the Nasdaq, the S&P 500 or Dow industrials) falls more than 0.2% in higher volume than in the prior session, that's a distribution day. Distribution means the big money — mutual funds, investment banks and other institutional investors — is dumping shares. That's bad news for the little guy, because institutions make up roughly three-fourths of the market and chart its direction. So the bottom line is that if the market rallying, and you see a cluster of distribution days occur within a fairly short time period, you should begin selling stocks. The market is likely heading for a tumble. Let’s take a quantified look at it. First, before I show test results I will say that clusters of distribution days do often occur near market tops – so they got that part right. But are they predictive of a top and should they be used for purposes of early identification? 3) Over the last 12 days there have been at least 4 distribution days. So if you wanted to use this red flag as a short signal, how would you do looking out over the next 1, 2, and 3 month periods? Needless to say these results are horrible. It appears that following a bout of distribution is NOT a good time to be selling. What if we flip the study on its head and instead BUY after such instances when distribution day counters are unloading positions? Not the most explosive results I’ve ever posted in term of average trade, but a decent edge nonetheless. Wins are bigger than losses and the winning percentage is pretty good. This makes for decent looking profit factors (gross gains / gross losses = profit factor). Is this a new phenomenon? Did distribution day counting formerly work and in recent years it has failed? That might explain why IBD has discussed it for so long. Sadly, no. 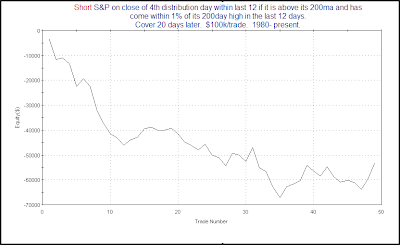 Below is the equity curve for the 1st test above using a 20-day holding period. While the results have been helped out by some horrible bear markets in the last decade, it’s never been a winning concept. This is somewhat similar to the perception that has been created with regards to follow through days for calling market bottoms. They occur there, but they are not predictive and are pretty much a worthless tool. For detail on follow through days, you may refer to the series I wrote last year. The primary difference here is that while follow through days are generally worthless, counting distribution days to try and identify tops is worse than that – it’s hazardous. The bottom line reality of distribution days is that when the market endures a pullback after an extended uptrend, it’s often a buying opportunity and NOT a time to sell. Of course there are still reasons to be cautious here, but of the things I am seeing that are of concern, distribution days are at the bottom of the list. Since I’m out of action most of this week and I’m sure this post will be viewed as controversial in the eyes of some, I’ve decided to give away the code. Rather than debate or re-run the tests different ways (I’ve already done that myself), Tradestation users may feel free to download the code themselves from the free download page on the website. Login is required. Sign-up is free and only requires a name and email address. In the past I've looked at gaps that occured after the marekt was already extended. This morning the market is set to open down big. It closed Friday in the middle of its recent range and was not extended. Below is one way to look at it. There appears to be a mild upside edge, though it's nowhere near as strong as it would be if the market were already extended downwards. This would suggest a pullback over the next few days is likely. While the pullback hasn’t necessarily been severe, it has been consistent. If you haven't taken a free trial before and would like to, simply click here to sign up and check out the Quantifineder and our other services. For those that may have trialed prior to the release of the Quantifinder in June, if you'd like another trial just send a request to support @ quantifiableedges.com (no spaces). And remember, the Q1 2008 studies package comes free with all annual subscriptions. We’re now entering the dog days of summer. 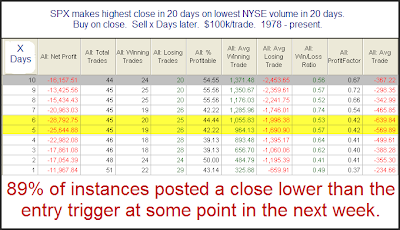 Volume at the end of August is typically slow and many times this means less trading opportunities. With that in mind, I’ve decided to run a “Dog Days Of Summer” special promotion. 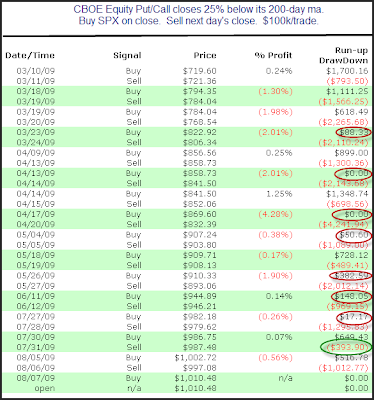 In 2008 I put together a package of Tradestation code that allowed traders to import the strategies used to test most of the studies posted to the blog in the 1st Quarter of 2008. Traders that have purchased the package have used the code to help them explore their own ideas about the market. The studies make terrific starting points for further research. They also serve as nice templates to use when exploring your own ideas. The package sells for $195. From now until the end of August, anyone who signs up for an annual subscription to Quantifiable Edges will get the $195 2008 Q1 Studies Package included Free. Whether you want the nightly Subscriber Letter and intraday notes and Quantifinder provided with the Gold Subscription, or the Weekly Research Letter and Silver edition Quantifinder provided with a Silver Subscription, you’re still eligible for the Dogs Days of Summer special promotion. And yes, I’m even including it as part of the Blogger Triple Play package which comes the the VIX and More and Market Rewind products. Triple Play is now better than ever with the new features recently added to the ETF Rewind product. So if you’ve been waiting for the right time to try an annual subscription – wait no longer. And if you’ve been considering buying the Q1 2008 Quantifiable Edges Studies Package, now you can get it free with your choice of an annual subscription. See subscription comparison here. I hope some traders are able to take advantage of this offer and use the Dog Days of Summer to better their trading and gain new insights from both their own research and the research of Quantifiable Edges over the next year. If you have questions, feel free to contact support @ quantifiableedges.com (no spaces). I'm short on time this morning so I am unable to provide an update on this reaearch from last year. I thought readers may find it helpful to note that the study did trigger. In June of 2008 I posted a discussion on the importance of normalizing put/call ratios when considering whether their readings were significant. In that post I showed that the average put/call ratio had risen steadily and substantially from 2000 into mid-2008 when the post was done. I included a “starry night” graph where weekly closing levels of the CBOE Put/Call Ratio were seen as dots and the 40-week moving average was drawn with a line. I’ve reproduced that chart below updated through 8/7/09. 1) A drop in the average put/call is not something you would expect during the worst bear market 70+ years. The 2000 – 2002 bear market is when the ratio began its 8-year ascension. Did traders actually become more complacent as the market cratered? The VIX action last year would suggest this was not the case. So why the drop in the put/call ratio? I suspect it has much to do with the emerging popularity of inverse ETF’s. With a new hedging tool at traders’ disposal, the demand for puts has waned. 2) “Why” really isn’t a big concern for me. What is important is that my analysis takes this information into account. Normalization remains just as important on the way down as it was on the way up. If last year you were viewing readings of 0.8 or 0.75 as possible complacence, then you need to realize that this year those readings aren’t much below average. And if the pace keeps up they’ll be average by the end of the year. Meanwhile readings that were just slightly above average last year are now fairly extreme. Normalization can be done a number of different ways. Moving average envelopes around long-term moving averages is one simple way to do it. Another would be to use Bollinger Bands. The exact method is not what’s vital. What’s vital is that your strategies and analysis account for the fact that – like the market – the put/call ratio (and many other gauges) evolves over time. One notable from Friday was the extremely low reading in the CBOE Equity Put/Call Ratio. 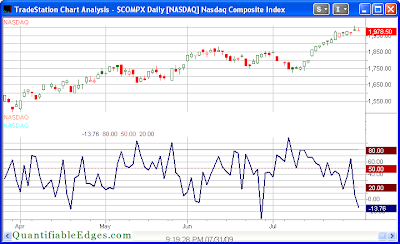 It closed at 0.49 – more than 31% below its 200-day moving average. In June I looked in detail at other times the Equity Put/Call closed more than 25% below its 200ma. It suggested a bearish edge for the following day has existed since the end of 2007. 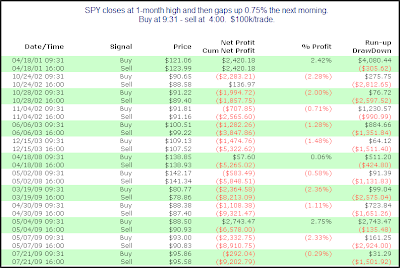 Concerned that the results were just a byproduct of a bear market I also showed all of the trades since the March low. Below I’ve updated that list with some additional observations. The far right hand column shows the intraday runup/drawdown. I’ve circled in green the -$393.90 result from July 31st. Since the trades are based on $100,000 each, $393.90 represents a move down of about 0.4%. What you’ll notice when looking at the list is that the 0.4% drop that day was the smallest intraday drop of any of the 15 instances listed since March 10th. 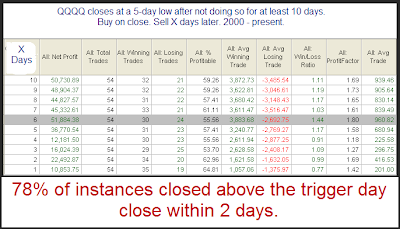 In red I have circled every instance where the intraday runup the next day was less than 0.4%. As you can see of the 15 instances, 7 of them had an intraday runup of less than 0.4%. This is all during a huge rally off the March lows. While it’s just one of the studies I looked at in last night’s Subscriber Letter, this one suggests risk/reward favors the downside for Monday. There does appear to be a small edge based on the size of the average trade. The winning percentage is a bit disappointing. It isn’t much better than random. In all I’d say there’s a mild edge that largely plays out in the 1st 2 days. Two days of sideways action has left me little to say this morning. One notable from yesterday was the very low CBOE Equity Put/Call Ratio. 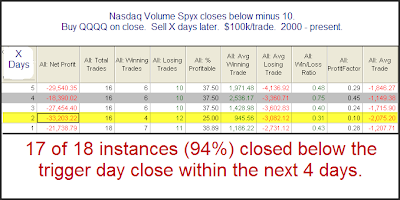 In June I published a study that triggered again last night and was noted by the Quantifinder both intraday and after the close yesterday. Below is a link to that study. Also this morning I added CSS Analytics to the blogroll. Rarely do I add brand new blogs to the blogroll but David has been publishing some very interesting work on some indicators he devleloped. If you haven't already, it's well worth checking out. I almost showed a bullish study this morning for all the bulls who've been screaming for one. But when an indicator like T21112 hits a new all time high, it deserves a mention. T2112 measures the percent of stocks that are trading at least 2 standard deviations above their 40-day moving average. It set an all time-high in May and I noted it then. It went on to peak 2 days later (May 6th). After that the market experienced a 3-day pullback and a bit of a consolidation. Monday it barely broke the old record. 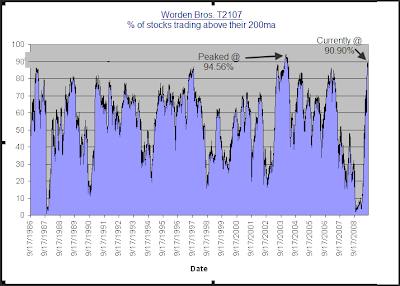 To provide some perspective as to how extended this indicator is I've shown below the full history going back to 1986. P.S. I also noticed T2112 got a mention from Cobra in his last commentary. One indicator I track on the website is the Nasdaq Volume Spyx. The volume Spyx calculation is proprietary but in general it looks at relative volume across multiple Nasdaq securities. Historically, very low readings have often been followed by quick declines and high readings have been followed by quick bounces. Below is a copy of the chart from the website. As you can see, the -13.76 reading is quite unusual. I ran a test back to 2000 to see how the QQQQ has performed following other readings below -10. While instances are a bit low there appears to be a significant downside edge over the next 2 days.